In my very slow quest to read all the plays of Shakespeare, I've not really gone about it systematically. Basically I try to balance the plays I'm actually interested in reading against the history plays, hoping not to get stuck with a whole bunch of King Whoever plays at the end. It's not that I'm anti-history per se, but I've never had an interest in war; not movies, not books, nothing. I realize of course that learning about war is important, but I'm usually bored to tears with it. And that's what most of Shakespeare's king plays seem to be about. So I've trudged through the three parts of King Henry VI and King Richard III. Not that there weren't parts or characters that I enjoyed (Queen Margaret was a pretty awesome villain), but not enough to get me excited about my next history play. So, I simply picked randomly from what was left and read King Henry V. In hindsight, and after doing (albeit minimal) research, King Henry V is the last of a tetralogy, after Richard II, Henry IV part 1 and Henry IV part 2. Reading those first might have increased my understanding and enjoyment. I'm not quite sure why King Henry the Fifth was invading France and I certainly didn't care a whole lot (nothing against the French mind you, but Shakespeare's play didn't really rouse my emotions in anyone's favour). Nor did I care for King Henry's crazily rushed wooing of the king of France's daughter, Katharine at the end. The courtship wasn't amusing, wasn't angering, wasn't beautiful, wasn't much of anything except unbelievable. Katharine did, of course, end up marrying King Henry but I'm not so sure that Shakespeare adequately explains how or why it happened. It wasn't a total waste of time though. I did enjoy Shakespeare's focus on languages in this play. First there was Fluellen, a Welsh captain in Henry's army. It was interesting to see Shakespeare's take on the accent, in particular replacing all his bs with ps as in pridges. Though he'd written other plays with characters of different cultures, I don't recall him ever writing to mimic the various accents. Imagine hearing Lady Macbeth saying "Oooot damn sput!" I assume this was done somewhat for comedy at the expense of the Welsh, though Fluellen does prove to be honorable and intelligent. There's also Katharine's attempts to learn English. Again, this was most likely for comedic purposes, especially as her attendant Alice gives her vocabulary lessons on English body parts. Yes, parts of that scene were amusing. I was also very surprised with the amount of French in the play and wondered what portion of his original audience would have understood-- not that it would have mattered too much. I didn't understand a lot and I still got the gist. On a trivial note, I was surprised to see a reference to tennis in the play. I had no idea it had existed for so long. 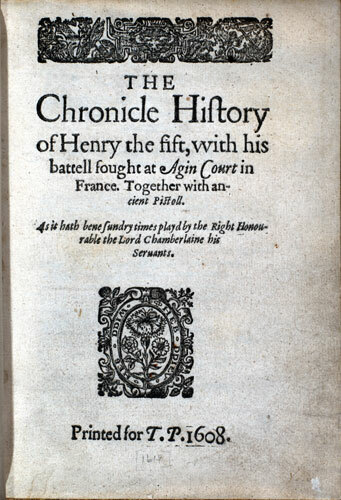 Thanks to Google, I've since learned that it has indeed but the version King Henry the Fifth would have played was much different than the game mastered by Venus and Serena today. So there you have it. Not my favourite Shakespeare play but not my least either. And hey, I learned something. I think reading Shakespeare is a daunting task. I speak from experience because just before Christmas I finished reading Hamlet with a group of grade 12 students. *g* Like you, I found it particular hard to slog through the History plays. I am much more partial to the tragedies! It wasn't until I got involved in a couple of productions, and heard the lines spoken correctly, and saw how the director managed the scenes, that I began to enjoy Shakespeare. Then I watched Kenneth Branagh's screen version of Henry V, and it blew my socks off. The lines flowed off his tongue so smoothly that I've been a fan ever since. Those British actors are tops when it comes to Shakespeare. Christie: I'd have to agree-- I'm also in favour of his tragedies. Steve: It was only after acting in MacBeth that I appreciated it. I had a high school teacher that just about ruined it for me way back in the day.